At St. Vincent’s Catholic Primary School we are dedicated to providing a varied Extended Schools programme for all children from Reception Class to Year 6. 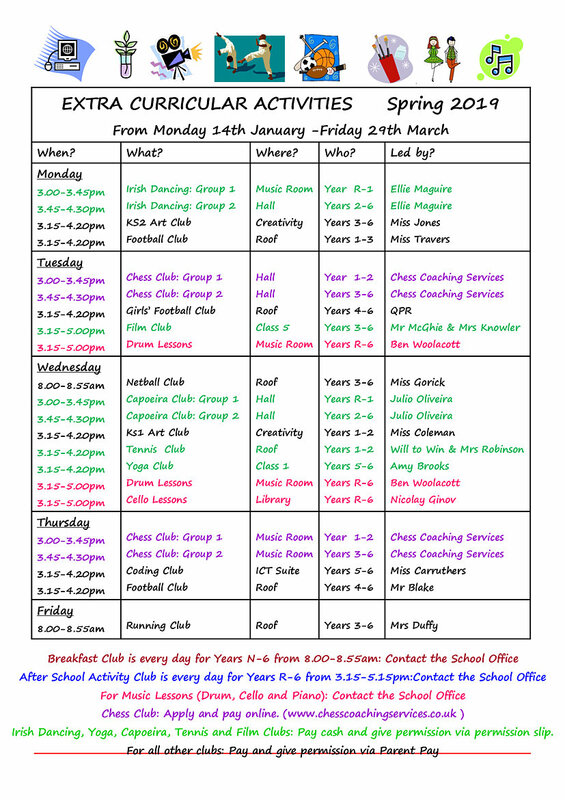 Termly Extended Schools Newsletters promote the timetable of extra-curricular activities for the term for your information. There is a charge per club, per term in order to cover costs. Despite having a very busy week, all of our teachers contribute to an extra curricular activity. We are grateful to them for their time and commitment to do this. 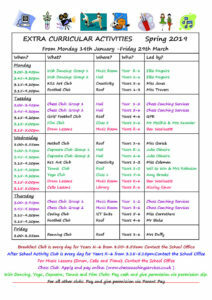 We also offer some extra curricular activities which are run by outside agencies. We constantly monitor the number and range of clubs available to the different age groups. Some of the clubs are kept small in order to give the children more individual attention but which means that children can only attend for one term in order to give everyone a chance. Some of the clubs are seasonal and will therefore only run in certain terms. The number of activities available increases as the children progress up the school. This is due to the fact that we have found that after a long day at school, many of the youngest children are often too tired to engage in extra activities. However we hope you find that there is something for everyone. We also provide a Breakfast Club and an After School Activity Club to support parents with childcare before and after school. There are a number of individual music tuition opportunities available at St. Vincent’s. If you would like to the contact details for any of our wonderful instrumental teachers please see the school office staff. We also have a fantastic Chamber Choir and Orchestra. ParentPay is the school online payment system that lets you make secure online payments by credit and debit card. You can also pay in cash at local PayPoint stores. It can be used to make cashless payments in schools for dinner money and activities such as trips, clubs and music lessons. Why not join the Tri-Borough After School Music Centre?